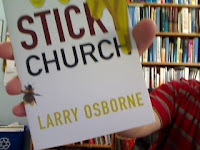 Want to win a copy of Larry Osborne's recent book Sticky Church? Here are a few hoops you will need to jump through; the more hoops, the better you're chances to win. Be sure and check out the rest of the Sticky Church blog tour while you're at it. Contest ends Monday, August 24, 2009 at 9:00 am (CDT). Winner will be contacted for shipping info sometime early next week. p.s. - You can read my earlier review on Sticky Church posted here last October.